Bernard Madoff stole the life savings of New Jersey state senator Loretta Weinberg. New Jersey Sen. Loretta Weinberg's nest egg had grown to about $1.3 million before investments with disgraced Wall Street investor Bernard Madoff wiped her out. 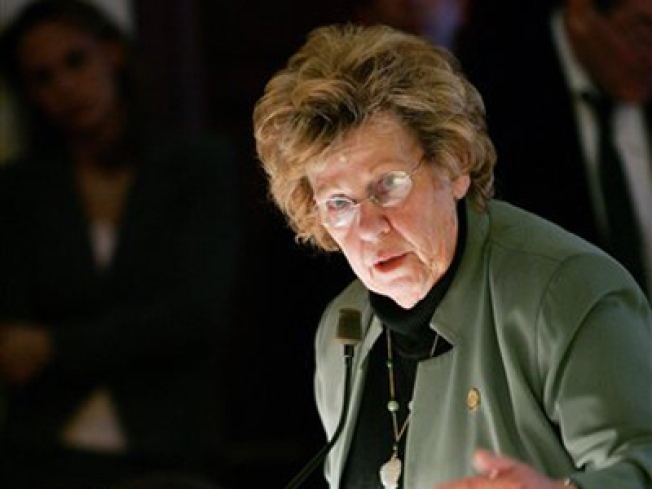 The 73-year-old grandmother believed she was financially secure until recently, when an accountant phoned a relative to say the Weinberg family's investments — including the senator's and those of many in her family — were now worth nothing. The Weinbergs, like New Jersey Sen. Frank Lautenberg's charitable foundation and scores of others, were victims of a multi-billion-dollar Ponzi scheme masterminded by Madoff. Madoff, a former NASDAQ stock market chairman, has become one of the most vilified people in America since news broke Dec. 11 that he allegedly had been running the scheme, paying returns to certain investors out of the principal received from others. "I was shocked first of all," said Weinberg, a Democrat representing Bergen County. "I had never heard of Bernie Madoff. My money was invested, along with many extended family members, with a financial adviser in Los Angeles." The Weinbergs' money manager, Stanley Chais, had invested his clients' IRAs, 401Ks and other funds with Madoff. The Wall Street Journal reported Monday that the Chais Family Foundation was invested entirely with Madoff, and shut down operations Sunday, after years of donating $12.5 million a year to Jewish causes in Israel and Eastern Europe. Weinberg's late husband, Irwin, was a hardworking businessman who believed staunchly in putting something away for a rainy day. The squandered money represents that which the Weinbergs scrimped and saved while raising two children in Teaneck. "Irwin had a saying, 'If you made a dollar and a half, you put 75 cents into a savings account and you lived on the other 75 cents,'" Weinberg told the Wall Street Journal for a recent story on Madoff's victims. "I was glad my husband wasn't here to see it," she said Tuesday, noting that he would have been beyond furious to have had his life-savings ripped off. Weinberg said she especially regrets that the losses sustained by charities invested with Madoff could make people reluctant to give. "My one moment of real anger was when I found out he was ripping off the Elie Wiesel Foundation," she said. "You have to have no morals whatsoever." The Elie Wiesel Foundation for Humanity is the charitable foundation of the Nobel laureate and Holocaust survivor, another of Madoff's victims. Despite losing her life savings, Weinberg, who makes $49,000 a year as a state legislator, isn't moping. The liberal lawmaker said she still has the work that she loves and the ability to pay her mortgage. "I'm really better off than a lot of people around us in our society today," she said. "I may be better off than some of the people who got ripped off in this scandal." Weinberg's even come up with laugh lines about her predicament. For example, she's been joking with friends that she's going to earn money by starting a new franchise: Granny's Pizza Delivery. The deliverers will use walkers that have been retrofitted with pizza-warming trays. She laughingly predicts that those grannies, including her, could pull in big tips.